The blue line is what this blog is about. 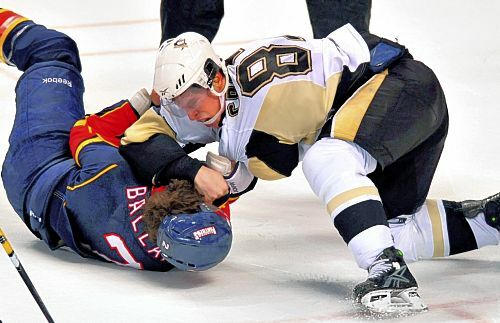 The brawler is also what this blog is about, so I will not give up on the enforcers in the NHL. The goon has almost disappeared and the hockey culture has been reborn in a kinder, gentler, business-like approach. The passion of the sport is purely in scoring. Fans don’t seem as eager to jump at the sight of a fight. Fans do however, still appreciate the posturing and the dropping of the gloves, but no further. Like any good business, bad PR and negative campaign ads can diminish the return on your investment. The Collective Bargaining Agreement (CBA) nears, and this is just the right time for players to behave and play to collect their piece of the pie. Just as any ruckus on the ice can put the power-play in motion, the ruckus from players must be substantiated by profitability they bring to the table. Popularity of players through Twitter lends the credible case for players to reap some rewards, but also gives personality to the cause. Some enforcers have curbed their thirst for blood as they know their days could be few. Instead, these smart players circumvented their talents into a positive approach, especially as younger players enter the arena with little history of brawling in junior leagues. The unfortunate tragedies of Wade Belak, Derek Boogaard and Rick Rypien only reminded the crowds that the limits on the game went too far in many ways. Fighting cannot be blamed for every pitfall in the NHL. Toronto Maple Leafs GM, Brian Burke, expressed remorse on the changing culture in the NHL for enforcers. Burke sent tough guy Colton Orr to minors for his diminishing role on the ice, despite having a key role in the team’s chemistry. New York’s Carl Hagelin is an example of a player who has exemplified the meaning of defending with smart play. With his speed and ability to be a two-way player, Hagelin wins the race to the puck often and floats on by without incident. New Jersey Devils star David Clarkson was good for a weekly fight the prior two seasons. After some cycling training with Lance Armstrong, Clarkson’s focus is maturing into more than just a brawler. Don’t get me wrong, Clarkson has racked up 88 penalty minutes thus far this season, including misconduct calls, but he’s not just all about the fighting. When you’re job is in danger because you are not changing for the times and the job description, re-training is in order. Clarkson was smart to recognize he’s not just a fisticuffs kind of guy. Dropping the gloves creates a certain feel to the game of hockey that other sports don’t possess. This topic has divided the hockey world for the past few years, and the culture has changed quite a bit this season. Brendan Shanahan’s tight watch has players like Daniel “car bomb” Carcillo in trouble for his hits. The recent suspension of Alex Ovechkin has us wondering if his skill can overcome his physical play that leads him into troubled waters. Ovie’s physical thwarts are entertaining and just his make; the tragedy would be for him to tone down his fingerprint on the hockey world. Sidney Crosby, arguably the greatest hockey player right now in the NHL, is suffering from a hit, not a brawl. Sid the Kid riled a few fights that were highlighted as an additional benefit to his talents. Ex-Raners agitator Sean Avery’s skills are not needed in New York, but he’s moving on to other things. Avery was a guest judge on Project Runway’s All-Stars this past week. His input was minimal, but he’s rebounding with his fashion involvement. It actually was a good opportunity for him, but kind of sad moment to see his almost extinction from the NHL. When will the hockey world really embrace a fight? When is it okay to let it rip? Obligatory violence is stupid, but fighting can be smarter. During the Board of Governors meeting, not only was the NHL realignment discussed but also the controversial issues of fighting. Many hockey fans favor banning fighting citing brain trauma and poor examples for kids playing hockey. Others, such as this author, believe it’s a turf thing- part of the game and can be acceptable if under control. Players can learn to be smarter when pulling a punch. Over the summer, three NHL tough guys died: Derek Boogaard, who died accidentally May 13 at age 28 after mixing alcohol and painkillers; Rick Rypien, who committed suicide; and Wade Belak, who reportedly committed suicide, but others insist he died in an accident. All three reportedly suffered from depression. NHL commissioner Gary Bettman warned about making the connection on the deaths to CTE and the role of enforcers in the NHL. The NHL has criticized researchers at Boston University, where extensive studies have been produced, for making simplistic, sensational conclusions based on unsupported claims not based on science. Bettman also drew the line of the personal lives of the players in relation to the studies. Experts consulting the NHL have said no one can draw a straight line from head trauma to CTE to mental problems because no one has proven what causes CTE, what its effect is or what the risk is of developing it. Certainly the enforcers may suffer from depression, which can lead to drug and alcohol abuse. Belak was a reluctant brawler because he knew that was his talent for the team. This topic will continue to be a factor in the future of the NHL and hockey in our communities. Everyone can agree that safety is most important in the battle against brain trauma. Keep up the good fight. Since I’ve been writing hockey, I’ve talked to many wonderful people in the hockey community. Everyone I’ve met has been so kind and forthright in their honesty about how great it is working in the world of hockey. But none have divulged any hidden secrets, rather “we’re just small town boys from Canada who just want to play the game we love.” This Septemeber 11 a nation will remember the tragedy that changed the international landscape. For the hockey world, this summer has changed the landscape of hockey. Fighting has always been a draw for fans of hockey, but recently the death of several enforcers have many perplexed. The untimely deaths of Derek Boogaard, Rick Rypien and Wade Belak were related to depression and substance abuse. The three enforcers had a total of 12 fights last season (7 from Boogaard, 2 from Belak, and 3 from Rypien). The NHL has institued new guidelines to discourage blindside hits and curb fighting all together. Is there a link between the anguish of these players and the role they played on the ice? There are strong links between brain trauma and addiction, which is to say that enforcers get hammered and most likely suffered some head trauma. With the phasing out of the fighting role under NHL commissioner Gary Bettman’s reign, these players roles have diminished. Dr. Robert Cantu is an expert on the link between brain trauma and addiction, and sugests that “the medial temporal lobe is associated with addictive behaviours and alcohol and drug abuse are addictions.” He futher elaborates on these specific cases that addictions are very common with Chronic traumatic encephalopathy (CTE). Mixing brain trauma, depression and substance abuse leads to the lethal combination which lead to the suicide deaths of Rypien and Belak. Belak’s depression came after his retirement from the NHL, despite securing an analyst job with the Nashville Predators. Though Belak was an enforcer, his hope was to score goals rather than fight but he wanted to be on the team and help in any capacity. If all you’ve ever done in your life is taken away, your identity is lost. Hockey players begin playing in pee-wee leagues and continue as far as they can go. Imagine beginning in your career at age 8 and retiring at age 35? Sounds great, but the emotions run high, self-esteem drops and your world becomes so small that your perception of the world changes along with how you fit in. From the outside looking in, most people see athletes as living a glamorous lifestyle without obstacles. Hockey players are human beings in a physically and mentally exhausting game. While it is a joy for those who play, there still remains pressures and expectations from the player and the team- especially themselves. When we see the fighting on TV or from the stands, we never think these enforcers don’t want to fight. Fighting has been an integral part of the game of hockey, yet it is the one thing that could detroy the game. The hockey world represents our world in so many ways. This Septemeber 11 will be a day of remembering so many who lost their lives that day. Let us remeber all those people in our lives who have perished and take the time to rember those people who are still in our lives.